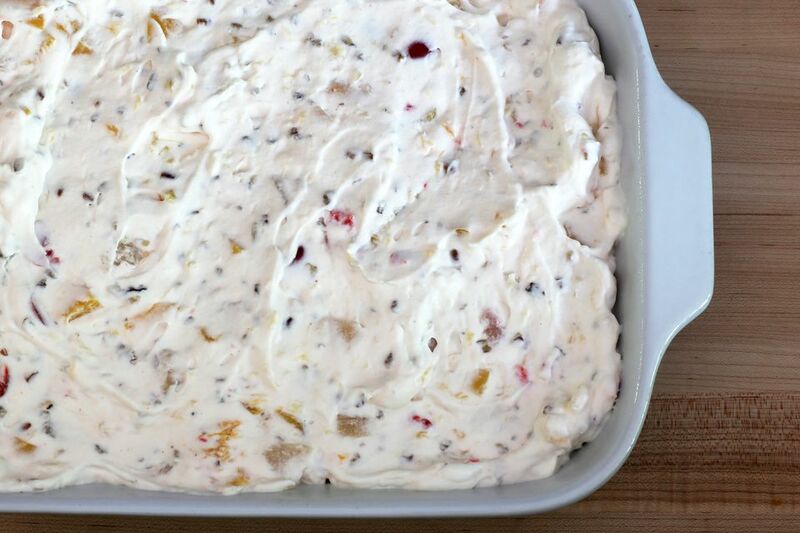 If a frozen fruit salad doesn't appeal to you because it includes mayonnaise, try this one. There's no mayonnaise in this version of the old-fashioned frozen fruit salad, and there are no marshmallows. Just fruit, pecans, cream cheese, and freshly whipped cream. Fruit salads are an essential part of a Southern holiday meal. The salad is a refreshing change of pace from the ubiquitous Jell-O salad, and it can even serve as a dessert. If you prefer a fruit salad with marshmallows, feel free to add 2 cups of miniature marshmallows. Use walnuts in the salad instead of pecans if you'd like. Instead of fruit cocktail, make it with diced pears or peaches. Or use a combination. For more pineapple flavor, add a small can of (drained) pineapple tidbits. Drained mandarin orange slices are another possibility. In a bowl with an electric mixer, beat the whipping cream to stiff peaks. Set aside. In another large bowl, beat the softened cream cheese with the milk and confectioners' sugar. Pour all of the fruits in a colander to drain thoroughly; add them to the cream cheese mixture and stir to blend. Spray a 2- to 2 1/2-quart shallow baking dish lightly with nonstick cooking spray. Spoon the mixture into the baking dish. Cover tightly with plastic wrap and freeze until firm. Take the salad out of the freezer about 15 minutes before you plan to serve it. To serve, cut the salad into squares. If you are using sliced fruits, drain the fruit and then dice it into 1/2-inch pieces. The cream will whip more quickly in a chilled bowl with chilled beaters. Put the bowl and beaters in the freezer for about 10 to 15 minutes before you begin. Start the mixer on low speed and increase it gradually to reduce splattering. Always taste nuts before adding them. Older, rancid nuts will ruin an otherwise delicious dish. Chop the pecans by hand or carefully pulse them in a food processor. Avoid over-processing, or you'll end up with nut butter. If, after chopping, you have a lot of fine nut powder, put the nuts in a mesh sieve or colander. Shake out the finest particles and discard them. The salad is an excellent dish for a Sunday dinner or holiday feast. Or take it along to a party or potluck event. It's a good replacement for ice cream in the summer, too. To lighten the salad a bit, replace the whipped cream with an 8-ounce tub of—light or regular—frozen, thawed whipped topping.